I've joined a group dedicated to making one new piece of jewelry each and every week for the next year - appropriately named, The Year of Jewelry Project. There are suggested themes for each week, although there is no requirement to stick to them. The first theme is "Renewal". I spent some time stressing about what to make. What represents renewal? I even resorted to Googling it, which brought up lots of seedlings and eggs and was less than helpful since I don't know how to make a seedling bracelet or an egg necklace. I finally decided to go back to my roots; the thing that really got me interested in making jewelry in the first place: macrame. 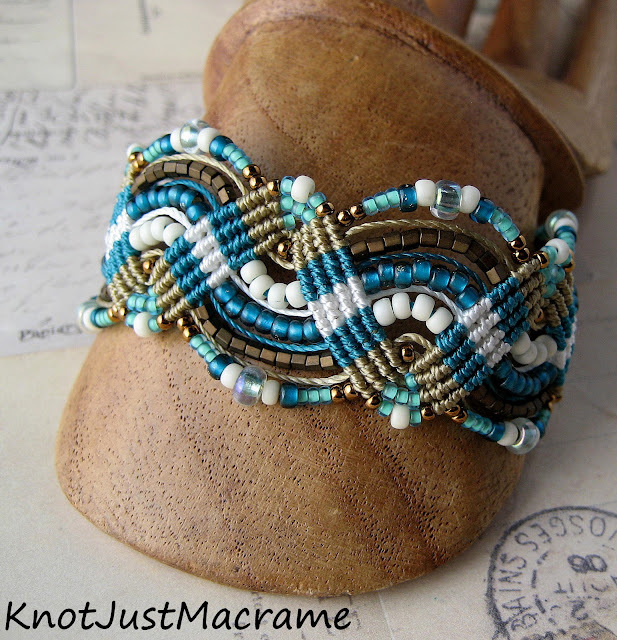 I started this journey years ago with micro macrame and even though I've made little forays into bead weaving or wire work or whatever shiny thing catches my eye, my roots will always be firmly planted in macrame. And what's more, this will always be "my" palette. The one I go to when I need to do something just for me. Something I will enjoy making without having to work too hard to make the colors speak to me. These colors sooth me. They are always just right. Take some teal or aqua or turquoise and throw in a bit of navajo white and a little khaki and I'm all set. I've decided THIS is my renewal. Like the way the waves wash up on the shore and wipe it clear every day. Reset. Great post and pretty bracelets. I think "renewal" by rediscovering your inspirational center is completely appropriate. And in this case, completely beautiful. I just drool over your work! I like how you left parts of the cord showing with perfect tension. The beads with the marbling on them are really pretty. Awed by your work as always! I would love it if you had a tutorial available someday soon :). A happy new year to you! I absolutely love your work!! I have a micro-macrame book and have tried to do a few pieces, but am not good at having things turn out the way I pictured them or the way they're supposed to, so thanks for posting all your photos, colors and designs - they really motivate me to keep at it (I love macrame, knotting and fiber work!) I look forward to seeing your posts each week for Year of Jewelry Projects! This is stunning! It just makes me swoon.